My childhood memory consists of countless backyard BBQs on the classic 1985 red Weber Genesis. Traditionally, many people would think back and envision their dad firing up the grill in the backyard, but my memory is filled with images of my mother mastering the grill at our backyard gatherings. Throughout my entire life, my mom has instilled her grilling knowledge upon me and she was my first grillmaster role model. As I started thinking of what I could do for my mom on Mother’s Day, I decided, why not celebrate her by grilling one of her favorite meals? So in honor of my mom today, I’m going to talk about her favorite grilled food, grilled rack of lamb. 2. Brush off grates, using a Weber Stainless Steel grill brush. 3. Set up the grill for direct grilling at a high searing temperature between 450-500 degrees Fahrenheit. 4. 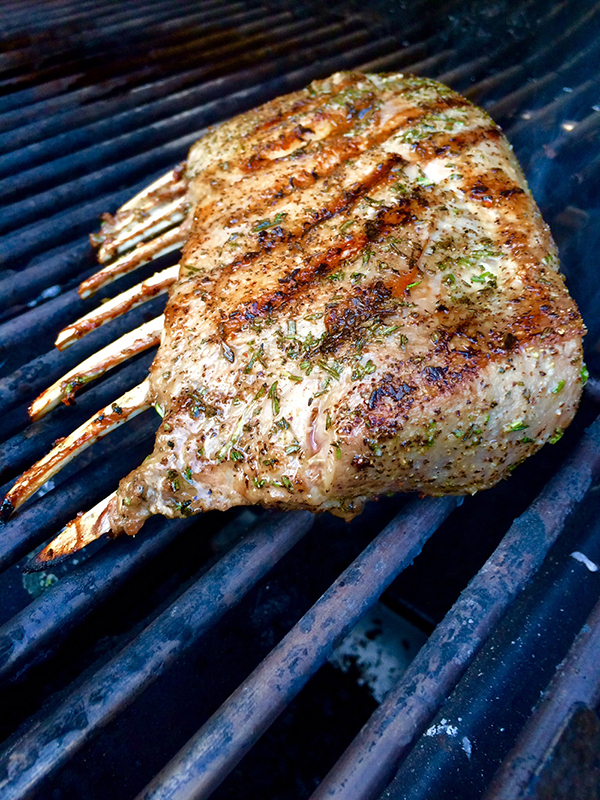 Lightly brush olive oil over the meat portion of the rack of lamb. Then season all sides of lamb with salt, pepper, granulated garlic, and fresh chopped rosemary. 5. Grill the lamb directly over direct heat, for 5 minutes total, flipping once. This will give you those beautiful, restaurant-quality sear marks! Tip: In order to prevent the exposed bones from blackening in color, you can simply wrap them with aluminum foil. 8. Rule of thumb always let your meat rest after taking it off the grill for 20 percent of the total cook time. During this time, the internal temperature will rise a couple degrees. Simply tent it under a piece of aluminum foil for 5 minutes and then slice rack into individual lamb pops and serve. Grilled potatoes always pair nicely with lamb and since my mom’s favorite are sweet potatoes, that’s what I decided to serve for Mother’s Day. To top it off and add a nice color and pop to your serving plate, you can also serve a side dish of mint dipping sauce for your lamb. At the end of the day, grilling your mom’s favorite meal is the best gift you can give to her on her special day. So find out her favorites, fire up your Weber, and I can guarantee you will put a smile on her face! Oh, and I must not forget, a glass of Champagne to toast the most important woman in your life. Happy Mothers Day to all the moms out there!